Genomic Health 2018 annual meeting is June 6. Will 40% owner Baker Brothers Advisors LP allow proxy access? 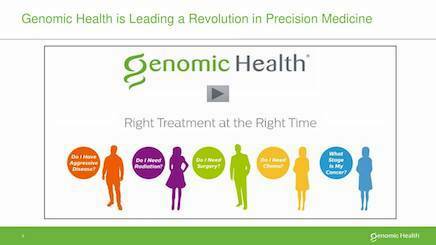 Genomic Health (GHDX) provides actionable genomic information to personalize cancer treatment decisions worldwide. If Baker Brothers eventually hopes to sell its shares into the market, they would do well to vote for proxy access. Other shareholders will pay a premium for shares of a company with proxy access and other corporate governance provisions that enhance board accountability. Most shareholders do not vote because reading through 20+ pages of the proxy is not worth the time for the small difference your vote will make, especially when one shareholder has such control. Below, I tell you how I am voting and why. I voted with the Board’s recommendations 25% of the time. View Proxy Statement via SEC’s EDGAR system (look for DEF 14A). From the Yahoo Finance profile: Genomic Health, Inc.’s ISS Governance QualityScore as of May 1, 2018 is 5. The pillar scores are Audit: 2; Board: 6; Shareholder Rights: 4; Compensation: 8. Therefore, Compensation and Board will be our key focus. Egan-Jones Proxy Services will not have advice on GHDX because none of their paying customers own it. If their customers owned it, they would analyze the proxy. With little to go on, I looked to see how CalSTRS and Calvert voted last year. Both voted against all directors. One possible explanation is that Genomic failed to adopt proxy access even though most shares had been voted in favor (except those owned by the Baker Brothers). Since a large number of investors voted against a similar plan last year and Texas Teachers voted against it this year, so did I.
Genomic’s shows the highest paid named executive officer (NEO) was CEO Kimberly J. Popovits at $4.1M. I’m using Yahoo! Finance to determine market cap ($1.4B) and I am roughly defining large-cap as $10B, mid-cap as $2-10B, and small-cap as less than $2B. Genomic is a small-cap company. According to the Equilar Top 25 Executive Compensation Survey 2015, the median CEO compensation at small-cap corporations was $3M in 2014, so pay was over that amount. Given above the low pay ratio, past votes of several funds and vote of Texas Teachers, I voted FOR. It was close. I could easily go the other way. I have no reason to believe the auditor has rendered an inaccurate opinion, is engaged in poor accounting practices, or has a conflict of interest. This is my proposal (James McRitchie), so of course I voted For. The proposal closely mirrors the SEC’s universal proxy access Rule 14a-11, vacated after what many believe to be a biased court decision regarding the SEC’s cost-benefit analysis. Proxy Access in the United States: Revisiting the Proposed SEC Rule, a cost-benefit analysis by CFA Institute, found proxy access would “benefit both the markets and corporate boardrooms, with little cost or disruption,” raising US market capitalization by up to $140.3 billion. Public Versus Private Provision of Governance: The Case of Proxy Access found a 0.5 percent average increase in shareholder value for proxy access targeted firms. I want to see the value of my investment rise. Hopefully, other shareholders do as well. As I write this on June 1, Proxy Insight had reported only on Teacher Retirement System of Texas. They voted against Cohen and proposal #2 to amend the omnibus stock plan. Supermajority vote requirement (66.67%) to amend certain charter and all bylaw provisions. No proxy access for shareholders. If a stockholder wishes to present a proposal to be considered for inclusion in our proxy statement for the 2019 Annual Meeting of Stockholders, the proponent and the proposal must comply with the proxy proposal submission rules of the SEC. One of the requirements is that the proposal be received by Genomic Health’s Secretary no later than December 28, 2018. Proposals we receive after that date will not be included in the proxy statement. We urge stockholders to submit proposals by Certified Mail—Return Receipt Requested.